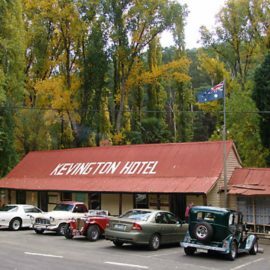 History, the Aussie bush and the rebellious Aussie spirit merge in the remote hills of Kevington, Gaffneys Creek and Woods Point. Head out past Jamieson and you’ll feel like you’ve traipsed back in time. Winding dirt roads between towering gums take you deep into gold rush territory that’s littered with relics from a by-gone era – tumble-down chimneys, tiny cottages, crumbling dry-stone walls and rusted mining artefacts. 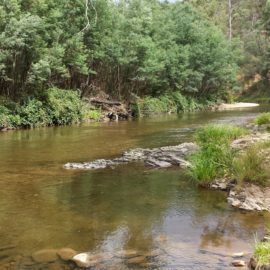 The Goulburn River also makes the Kevington – Woods Point area a favourite summer holiday camping destination. Set up camp and pull out the fishing rod at one of the riverside camping sites scattered along the river. Then complete the trip with a visit to one of the local pubs in Kevington or Woods Point where you’ll enjoy a country feed and good old-fashioned hospitality. Gaffneys Creek and Woods Point are the remotest communities in Victoria, and it takes a certain strength of character to call these villages home. But among the old miners’ cottages and historical artefacts you’ll find an engaging mix of foodies, brewers and musicians only too willing to dish up great food and beer, paired with stories of boom and bust. While in the area make sure to call in to the Woods Point Museum where you can see photos of the town in its former glory – 36 pubs, stores, banks and churches. And don’t miss the renowned old Woods Point fuel station. This steadfast little piece of history has survived two devastating bushfires to become one of the most photographed servos in Australia. Just make sure to top up the fuel tank before you leave Jamieson – as the old Woods Point fuel stop is no longer operational!